Send your kids on an epic safari adventure! 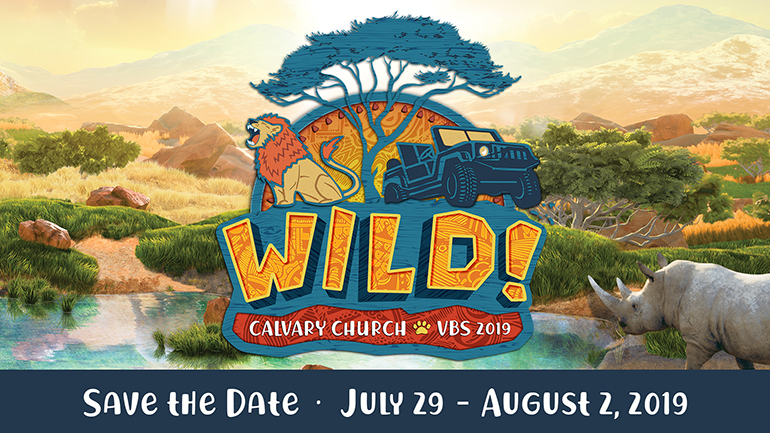 At Wild VBS (Vacation Bible School), kids explore God's goodness and celebrate a ferocious faith that powers them through this wild life. Wild is filled with incredible Bible-learning experiences kids see, hear, touch, and even taste! T-shirts will be available this year for $15. You will be able to purchase them starting in June in the Calvary Town offices or in the Calvary Church lobby on Sunday mornings in the month of July. You will be able to purchase shirts with cash, check or credit card payments. Don't worry though, registration will open soon. 1st - 6th graders can be pre-registered online, or they can join us by coming to the registration tables on Monday morning and filling out a paper registration form.